Looking for Assistant Professor jobs in Arts Colleges 2019 in Tamilnadu? or Searching for Faculty Teachers Tamil Nadu March 2019? 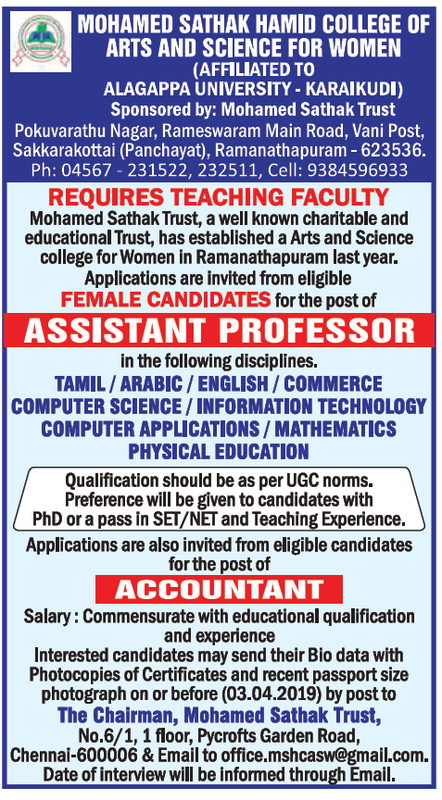 A college based in Ramnad named Mohamed Sathak Hamid College of Arts and Science for Women, Ramanathapuram has advertised in THE HINDU newspaper for recruitment of Assistant Professor / Accountant jobs vacancies. Interested and eligible job aspirants are requested to apply on or before 03rd April 2019. Check out further more details below. About College: Mohamed Sathak Trust is a Charitable and Educational body having its registered office in Chennai. The main aim of the Trust is to encourage and educate youths from backward communities. Mohamed Sathak Group who are Multi Million Conglomerate having other Businesses in Exports of Coffee, Cardamom, Pepper and having their establishment in Hotel Industry,Automobiles, Jewelry, Construction, Software Development & Consultancy. How to Apply: Interested candidates are requested to send their detailed application along with CV, copies of certificates and recent PP size photo to the postal address and email address provided below.